NES The Immortal (USA) in 09:25.37 by DrD2k9. 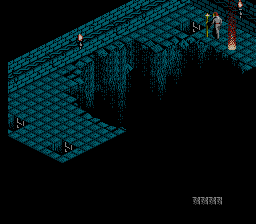 The Immortal is an isometric adventure game originally created for the Apple IIGS, which was ported to the Amiga, Atari ST, MS-DOS based PCs, NES, and Genesis. The main plot revolves around a wizard attempting to find his mentor in a large and dangerous labyrinth. DrD2k9 crawls his way through the labyrinth and completes the game as fast as possible. This movie is a 53.82 second improvement over DrD2k9's previous work.